This morning I was rudely woken from my slumber by the screech of a 12-year-old girl. Nothing quite matches the pitch or frequency that particular age and gender can hit. “Dad! There’s a raccoon in the garage!” This was indeed a rude awakening. I had visions of a snarling, feral raccoon tearing up everything in the garage that can possibly be torn up – pet food, trash cans, boxes from moving. Could I have heard none of this from my bedroom which shares a wall with the garage? I am not a sound sleeper in the early hours of the night, but sleep more soundly as the sun starts to rise. The Husband and the Boy head to the garage, curious to see what it looks like. I bury my head under my pillow once more. I have no need to go see what the furor is. And there is no furor. They see nothing. “Bunny, did you see the raccoon?” “Yes, Dad, I saw it looking out at me. I thought it was Spud at first, but it’s not.” Spud is one of our much spoiled and much-loved cats. The garage is suspiciously untouched with no signs of the ravages one would expect from a raccoon being trapped overnight. After looking around with no success, everyone leaves for work and for school. I drag myself out of bed and head off to work. In the kitchen. I start my day by making a cup of coffee (Green Mountain Breakfast Blend) and sitting down to read the emails I had received overnight. Something catches my eye outside the kitchen window. A sharp-toothed, rat-tailed opossum sauntering across my field of vision from the garage side of the house to the patio side of the house. Hmmm… I muse, could this be the raccoon that Bunny saw? The next question in my mind is does my 12-year-old really not know the difference between a raccoon and an opossum? I’ll give her the benefit of the doubt on this one. Raccoons and Opossums live in the 5 acre wood. Working at home leads to all kinds of new adventures. Opossums have a great love for cat food. I would add to that a #5 that I like coffee, but I already knew that! Noon Update: I guess today is the day for wildlife. 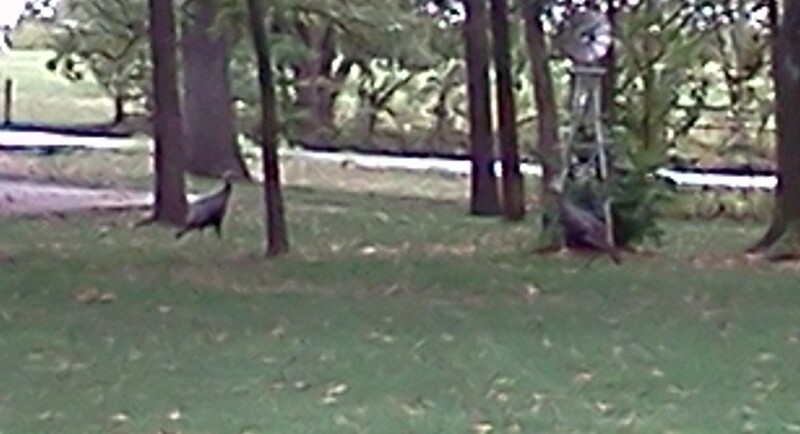 I just looked up and a couple of turkeys wandered across the lawn. Sorry about the poor picture quality, but I just grabbed my cell phone. Turkeys in my front yard!